Hard not to smile when you hear this bird! Some bird songs leave us in admiration of their beauty, some with a sense of wonder at their complexity—and others are downright comical. 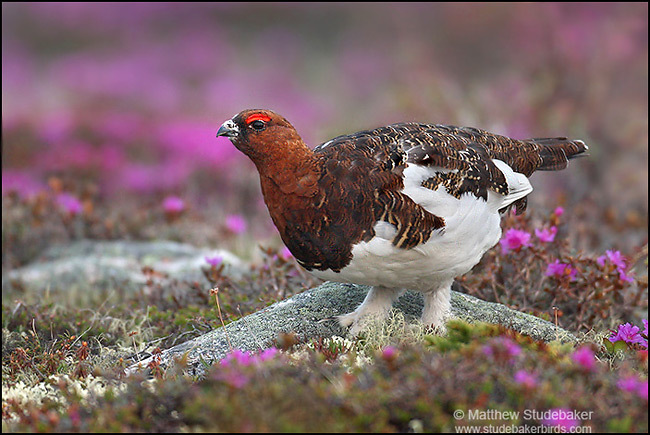 As a maker of silly sounds, the male Willow Ptarmigan beats the Three Stooges hands down. But these sounds are no laughing matter. Where it nests in the shrubby willow tundra of Alaska and Canada, the Willow Ptarmigan crows to attract females and show other males he’s in charge of his territory. Some bird songs leave us in admiration of their beauty, some with a sense of wonder at their complexity—and others are downright comical. This male Willow Ptarmigan sounds like he might be laughing, or at least doing his best to make others laugh. As a maker of silly sounds, he beats the Three Stooges hands down. For the male ptarmigan though, these sounds are no laughing matter. Where it nests in the low, dense, shrubby willow tundra of Alaska and Canada, the Willow Ptarmigan crows to attract females and show other males he’s in charge of his stretch of tundra. This stocky, northern relative of grouse and chickens is a bright rusty brown above with a white belly and wings. The hen ptarmigan is so well camouflaged in brown tones, you might be looking right at her and never know it. But the male is another story: picture those white wings propelling that chunky rusty body in a long arc over the tundra [Willow Ptarmigan flying], as he chuckles his way across the tops of the willows. Call of the Willow Ptarmigan provided by the Macaulay Library of Natural Sounds at the Cornell Lab of Ornithology, Ithaca, New York. 105769 and 105848 recorded by G.A. Keller. Theme music composed and played by Nancy Rumbel and John Kessler.